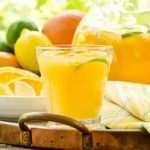 Fresh Citrus Wine Punch is made with fresh orange, grapefruit, lemon, and lime juices. It's great for brunch, showers, potlucks, or any celebration. Stir together all juices and wine. Taste and stir in sugar until dissolved if desired for more sweetness. Chill thoroughly and serve with chilled citrus slices.